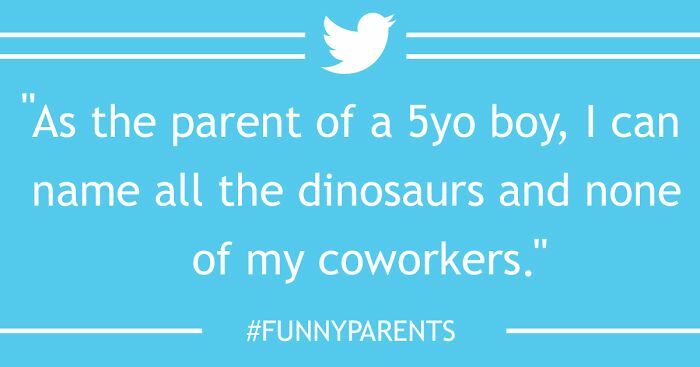 We all know that kids say the funniest things, but what about the parents? Well it turns out that they say some pretty funny things too. Hahaha truth! I remember crawling on hands and knees into my sons room so quietly, just to see if he was asleep or awake. ma 30 year-old has always made it a point of wearing different socks: just adds to his aura. And we decided that warm food isn't so tasty alter all. This. Is. So. True. Even though I'm not a parent, my little brother always did this. Not for me. My youngest called all of her poop piggies. Before she could flush she had to name each turd and then tell it bye-bye. This sounds weird, because as a 14yo girl, I love Maths, especially Algebra! So true, had the TV to myself, then realised I had been watching Jake and the Neverland Pirates for over an hour. Too exhausted to notice! Hey, sometimes it's hard to perfect a picture for homework. Ever think of that? My brother looks at his hands, holds up a number and then says something like "eighty two thousand!" When i get dressed my son asks me if we are going to church or the grocery store..
Like a woman in a frat house? My son ... keeping clothes on him was an epic daily struggle. This applies to husbands as well haha!! This is how I'm going to start singing this song!!!! My best guess would be so they could buy a sense of humor. how true ans while holding, hearing "wait, wait"
I'd be in another room, desperately trying to swallow my treat and my 4yo daughter would come running and say "I smell chocolate on your breath!" And typically after having explosive diahrrea that has covered their clothes and hair and body. OMFG, and they have to closely examine each one first. Too true and funny! Always loved when they would pout, house was quite for a few minutes. I've done that and I don't have any kids yet. I only have four and it's like this. This is the truest description I have ever heard. My father caught on to that. Oh. the confussion.